The alarm went off at five thirty AM but the anticipation and excitement had been the wake-up call in the early hours of Wednesday morning. It was time to hit the road towards Northern Georgia for ZCON 2018 and so after tying up a few last minute details and getting a full tank of gas, we were off. ZCON 2018 is an annual convention for all Nissan/Datsun Z cars and Infinitis as well. The event featured, car shows, mount cruise, Road Atlanta track day, TED talks and much more. Some folks will tell you that driving in Florida is boring because the roads are straight and because much of south FL is swampy but there’s a certain beauty in the openness of the horizon that is particular to this region. But as we near the Georgia state line you start to notice the change in the terrain. The trees seems older and taller, the dirt goes from being black and sandy to a vibrant shade of yellow and orange and the rolling hills start to make the roads more engaging to the drivers. It was a nine hour drive to our first stop, Z1 Motorsports. Together with ZCCA, (Z Car Club of America) Fairlady Alliance and Georgia Z Club, Z1 combined their local event, Z Nationals with ZCON 2018 to make it an EPIC car event. Additionally Z1 Motorsports opened their fifteen thousand sq. ft. facility to the public allowing us to tour their enormous shop. Unfortunately we only got to spend a couple of hours hanging out with the Z1 crew because by the time we got there it was already quite late in the day. Part of the reason we were so late is because on the drive north from South FL we developed a strange vibration on our 350Z’s rear brakes and we knew that this issue had to be addressed prior to racing the car at Road Atlanta in just a couple of days. Luckily we were able to purchase a new set of rear brake rotors from Z1 Motorsports while we visited them. Huge shout-out to those guys for helping us on such a last minute situation. Be sure to check them out online or if you live close to their shop in Carrollton, GA don’t hesitate to drop by. Upon leaving Z1 Motorsports, an hour and a half later after negotiating our way through Atlanta’s notorious rush hour traffic, we finally arrived at the Sonesta in Duluth, GA. First thing you should know is that ZCON 2018 was hosted at this massive hotel, consequently, ninety percent of all attendees were staying at the Sonesta for the duration of the event. This meant that folks parked their race cars, show cars, antiques, trailers and trucks all around the hotel’s parking lot and parking garage. What a sight to see it was as we pulled into the parking lot. 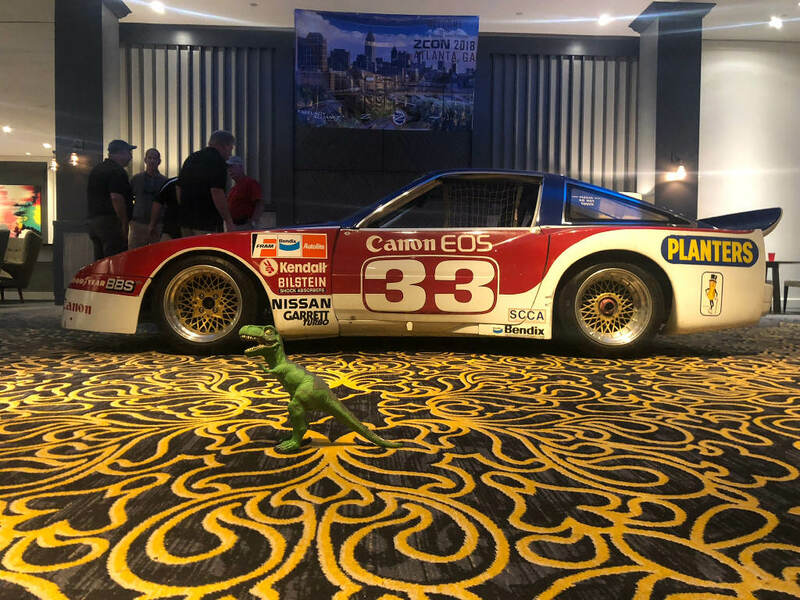 There were so many S30s, Z31s, Z32s, GTRs, 510s, Infinitis and other awesome looking cars spread throughout the property that even before we set a foot inside the Sonesta we knew we were amidst car enthusiasts. 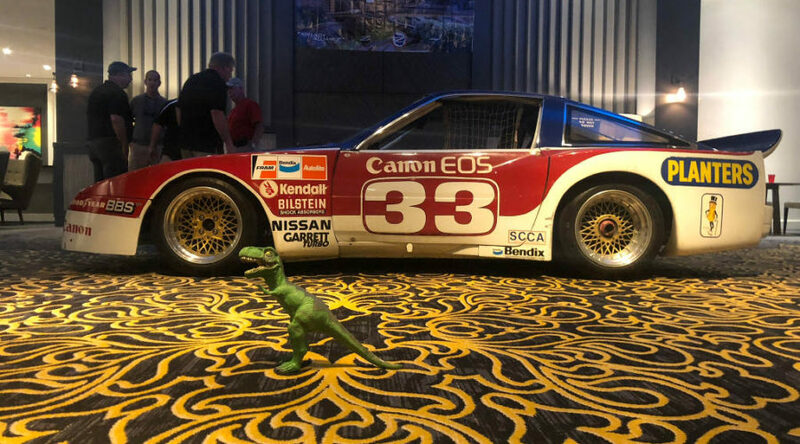 Upon walking in, the first thing that caught the eye was a vintage Datsun race car parked inside the hotel in the middle of the lobby. Gathered all around the floor were groups of ZCON attendees socializing and catching up with old friends. We were definitely greeted with a feeling of comradery and belonging from the Nissan community and soon we had joined the mirth ourselves before turning in for the night in preparation for the next day’s events. And thus, after a long drive and a welcoming reception, we went to bed.